What to read in the name of your granular fertiliser? Het jy al gewonder wat die syfers op jou kunsmissak beteken? The fertiliser in this example contains two parts Nitrogen, 3 parts phosphate and 4 parts potassium. The concentration is 37% (37% of the content is nutrients, 63% is inert). % Nitogen (N) = [parts nitrogen/(parts nitrogen + phosphate + potassium)] x percentage = [2/(2+3+4)] x 37 = 8,2%. % Phosphate (P) = [parts phosphate/(parts nitrogen + phosphate + potassium)] x percentage = [3/(2+3+4)] x 37 = 12,3%. % Potassium (K) = [4/(2+3+4)] x 37 = 16,4%. Dit is nou vir jou duidelik dat die syfers op die kunsmissak vir jou vertel hoeveel stikstof, fosfaat en kalium in jou kunsmis voorkom. Dit vertel ook vir my wat die verhoudings tussen die verskillende voedingstowwe is. Indien jy ‘n kunsmis wil koop met meer stikstof as kalium, sal jy ‘n kunsmis kies waarvan die eerste syfer (stikstof) hoër is as die laaste syfer (K) (so ‘n tipe kunsmis sal jy byvoorbeeld vir grasperke en loof gebruik). Indien jy ‘n kunsmis wil koop met meer kalium as stikstof, sal jy ‘n kunsmis kies waarvan die laaste syfer (kalium) hoër is as die eerste syfer (stikstof) (so ‘n tipe kunsmis sal jy byvoorbeeld vir groente gebruik). Indien jy ‘n kunsmis wil koop met min fosfaat, sal jy ‘n kunsmis kies met ‘n middelste waarde van 0 of 1. Indien jy ‘n kunsmis wil koop met baie fosfaat, sal jy ‘n kunsmis kies met ‘n middelste waarde van 2 of meer. Met ‘n bietjie dink en wiskunde kan jy nou ook uitwerk hoeveel kunsmis toegedien moet word om ‘n sekere hoeveelheid voedingstowwe toe te dien. Werk nou vir ons uit hoeveel 2:3:4(37) toegedien moet word as jy 2 gram stikstof op een vierkante meter wil toedien? E-mail die antwoord na florcom@icon.co.za. These granular fertilisers consist of different ratios N:P:K. The ratio between the nutrients and the concentration of the nutrients are reflected in the name of the fertiliser. The fertiliser in this example contains 11 parts N, 1 part phosphate and 8 parts potassium. The concentration is 20%. 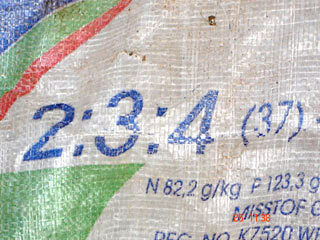 The fertiliser in example 2 contains three parts N, 1 part phosphate and 5 parts potassium. The concentration is 36%. % Nitogen = [3/(3+1+5)] x 36 = 12%. % P = [1/(3+1+5)] x 36 = 4%. % K = [5/(3+1+5)] x 36 = 20%. Some suppliers have also added calcium, magnesium and trace elements. Both these phosphate-containing fertilisers are not soluble. It is therefore necessary to incorporate it properly into the topsoil. Name Formulae Nutrient content (%) EC value (mS cm-1) at 250C. Column 1: These are the common names of the fertilisers. Column 2: In this column the chemical formulae of each fertiliser is given. Column 3: This is the amount of nutrients in the fertiliser. Column 4: This is the electrical conductivity of one gram of the fertiliser if dissolved in one litre of distilled water. Foliar feed contains macro elements, trace elements and sometimes also growth stimulants. An endless list of products is available.